Black walnut trees produce highly prized wood and nuts that are considered somewhat of a delicacy, if a bit challenging to work with. Black walnut trees should always be pruned during their dormant period at a time of seasonal climate and in a manner that will cause the least amount of stress to the tree and its root system. Pruning black walnut trees is done to control their shape, size, branching form and to influence the grain quality of the wood they produce if it is intended to be harvested for lumber. Pruning should be conducted when the tree is in its dormant season and its leaves have dropped to expose the branching architecture. The dormancy period for black walnut trees typically runs from late November through late February or early March in most climates. When pruning a Black Walnut tree, never cut off more than half of the complete tree height or remove more that a quarter of the live branching crown, as this will shock the tree. If there is significant dead branching, this can be removed without counting toward the quarter crown removal guideline. Minimize the size of the cut raw wood surface to prevent disease and damage, so never cut into a branch's collar but just outside of it where the branch narrows. When cutting away a dead branch, leave a small amount of the dead callous wood and do not make a raw cut into fresh healthy wood. Try to restrict pruning to branches that are 1 to 2-inches or less in diameter as smaller cuts heal much more quickly and are less susceptible to disease and decay. After making your cuts with a clean sharp bladed tool, skip the step of applying sealant or paint over the raw wood cut sites and allow the cut branches to callous over and heal naturally. 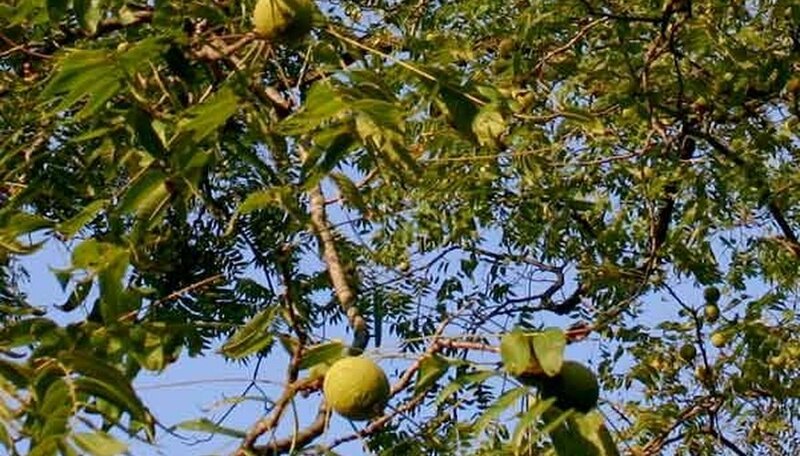 If you are growing your Black Walnut tree for timber harvest, you may need to correctively prune it to straighten the trunk and therefore preserve its most valuable wood grain. Corrective pruning is done when the tree is a sapling to encourage a straight trunk and straight stems. Corrective pruning is also done in dormant season and is not done for trees grown for their nuts or as ornamentals, as it is unnecessary and can set back the growth of the tree canopy. In time many trees will likely straighten out when left to their own devices.